數以百萬計的全球企業和消費者信任 Acronis AnyData Engine＆mdash; 最先進的備份技術. - Wi-Fi support in WinPE media. - Information about recovery operations was added to the Activity tab. - Improved the statistics diagram on the Backup tab. - A link to the Online Dashboard was added to the Account tab. - In-product notifications about license conflicts were implemented. - Reworked error messages for the cases when a backup destination is not available. - A new calendar-based retention policy for nonstop backups to the cloud. - The ability to re-scan a QR code to reconnect mobile devices to a computer. - A new default setting to prevent a computer from sleeping during mobile backup. - Issue fixes and other improvements. - Old cloud backup versions are not deleted if the retention rules are set up by version age. 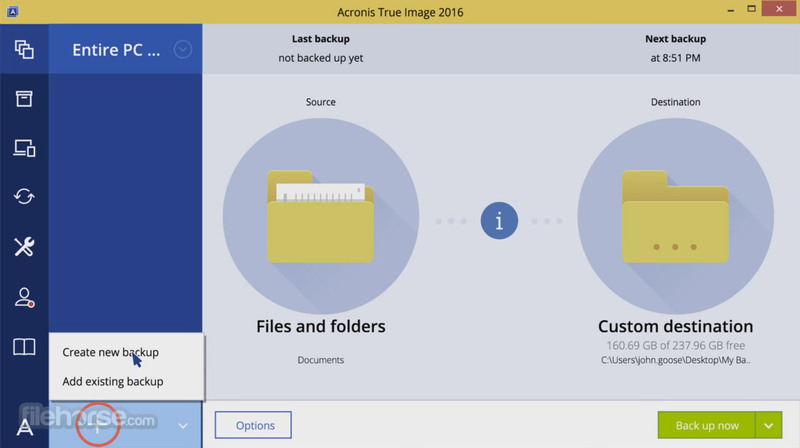 - Acronis True Image does not start when you click 'Open settings' in the notification area icon menu. - Incorrect local archive size calculation in the console. - An incremental Instagram backup fails with the 'Error from Archive Server' error if the previous backup was canceled. - On Windows 10 Fall Creators Update, an empty recovery screen is shown during the second recovery attempt of a password-protected backup. - Windows Fast StartUp becomes disabled after the Acronis True Image installation. - A Hyper-V virtual machine cannot be updated when Acronis Active Protection is turned off. - The error 'Failed to add the backup to the backup list. The backup may be locked or corrupted.' appears while adding a backup located on a DVD. - The 'Unable to format media' error is displayed when trying to create a Linux-based bootable media on a 64 GB USB flash drive formatted to exFAT. - When configuring partition recovery, the changed partition properties in the 'Manage partition' dialog are not saved. 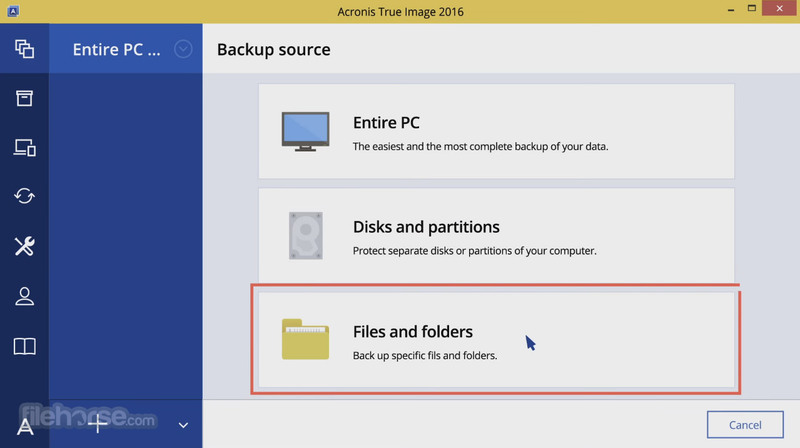 - [TI-120886] Under WinPE-based media, the error 'Acronis True Image backup file is corrupted' appears when attempting to recover data from a backup located on a Linux network share. - [TI-119448] The message 'The data you are trying to use is blocked at the moment. Please try again later.' appears on backup deletion. - [TI-112797] A backup stops after clicking 'Back up now' if the setting 'Do not back up on battery' is turned on and the power adapter is unplugged. - [TI-117123] The Acronis Active Protection notification area icon is shown as unavailable after the product update from build 9207 to build 9660. - [TI-115928] The archiving operation fails with error 'Write error' after the computer is woken up from the sleep mode. - [TI-54006] Some files remain on the local PC after archiving if the Internet connection is lost for some time during the archiving operation. - [TI-102104] Intel Stream x360 does not boot after recovery from a cloud backup. 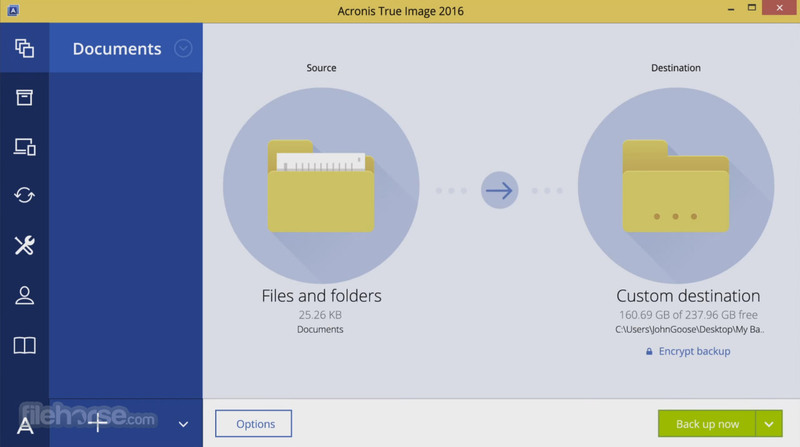 - [TI-100468] Acronis True Image requests credentials for a mapped public network share during the backup destination selection. - New! Backup Statistics and Activity graphically represents content of a backup, provides statistics for backed-up file categories, such as documents, photos, videos, music, and others. Backup activity streams allow you to track history of backup operations starting from a backup creation, the operation statuses, and to analyze the statistics for successfully backed-up data. - Improved Media Builder to create WinPE media by using Windows Recovery Environment without downloading the additional component—Windows ADK or Windows AIK (up to 6 GB). You can customize your media in Advanced mode, or use the predetermined settings of Simple mode. - New! Active Protection Dashboard monitors how many potentially risky processes have been flagged, and the number of files duplicated in cache to protect them from the risky processes. The dashboard provides statistics for blocked, trusted processes and allows you to manage a permission list so your trusted applications could run as normal. - Improved Active Protection compatibility with Windows Defender and other third-party antivirus software. - Improved Clone disk utility—You can clone disk on an active Windows system without having to use bootable media. 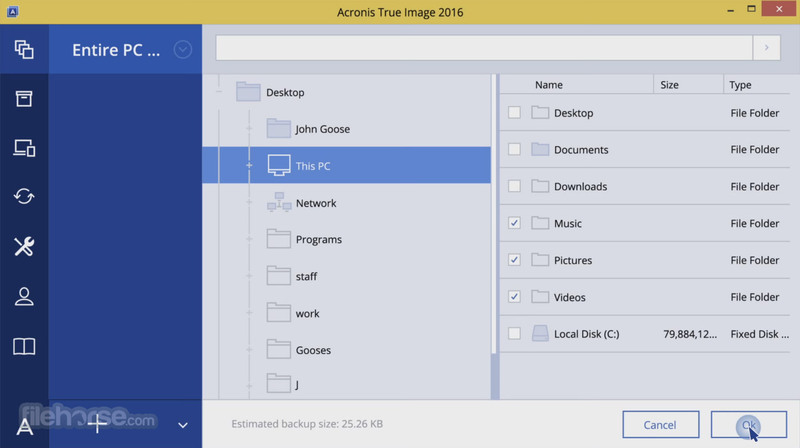 By using the volume shadow copy service (VSS), Acronis True Image allows you to create a snapshot of the active partition and boot from the new disk. - New! Conversion to Virtual Machine—Convert Acronis backup files to the Microsoft Virtual Hard Drive format to ensure the system will boot starting a virtual machine with Hyper-V. You can also mount a .vhd(x) file as a virtual hard drive. - New! Faster file and system recovery with the enabled WAN optimization option that increases download speed from Acronis Cloud data centers. - New! 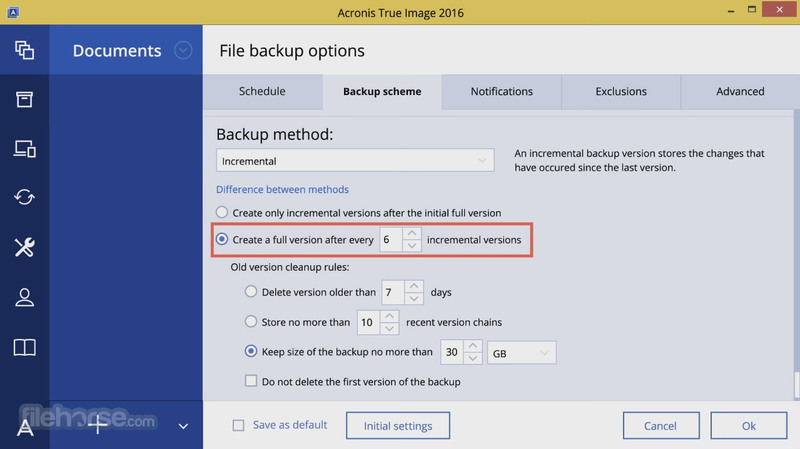 Faster Incremental Backup for disk and partition backups with Acronis Changed Block Tracker (CBT). The Volume Tracker reduces the amount of time taken to perform incremental or differential images by monitoring the changes to an image in real-time mode. - New! Laptop power setting allows you to pause backup while working on battery to save the battery power. The paused backups will continue automatically after connecting power adapter. - Mobile devices are available in the backup source list. - Access to backup shortcut menu with right-click. - Progress bar was updated with application window blurring. - Fixed issue with the search dialog that did not provide functionality of recovering several files from different backup versions. - Fixed issue with possibility to move a backup from a password-protected network to a local drive or to another share.